Many years ago I was given a special Christmas gift – a pastel portrait of my dog, Jessie. The gift was even more meaningful because Jessie had just come home on Christmas Eve, having spent the prior week in intensive care. She was very ill, but her failing body was no match for her beautiful spirit. Jessie and I had that Christmas…and three more wonderful months together. Her portrait hangs in my office, along with one of her daughter, my beloved forever dog, Martha. 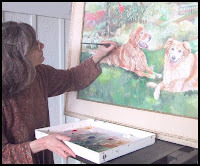 If you are thinking about having a portrait done of one of your critters, I want to let you know about Connie Bowen. They say “A picture is worth a thousand words.” In Connie’s case, both her artwork…and words…are priceless!